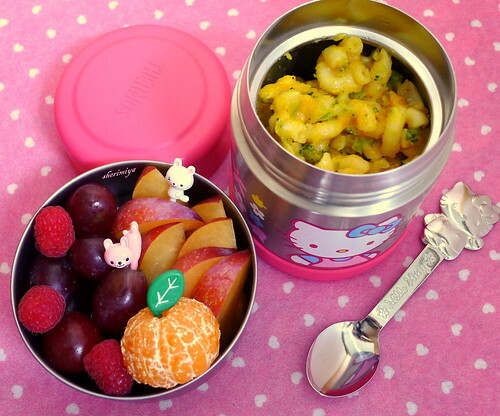 Mackin Cheese Thermal Bento, a photo by sherimiya ♥ on Flickr. what a great blend in for all the good ingredients! Awesome! I love Mackin cheese with broccoli :) The kabocha is genius BTW! Brilliant. What a great way to introduce new veggies. I bought that Hello Kitty canister thing for my niece. So cute! Thanks Bobo, Heather and Haej! The kabocha / cheddar thing is one of my finer moments, if I may say so myself. This thermal jar works pretty well and is the perfect size for the toddler set. Sound very yummy.. Love the recipe.. I love mac and cheese! This bento must be very yummy...:)! !